HURRICANE – What began last Tuesday as a meeting with officials about the broader picture of maintaining access to public lands quickly turned into a debate about a proposed land swap involving a 1,200-acre chunk of the Sand Mountain off-highway vehicle area, a move opponents believe would open the floodgates to development in the area. 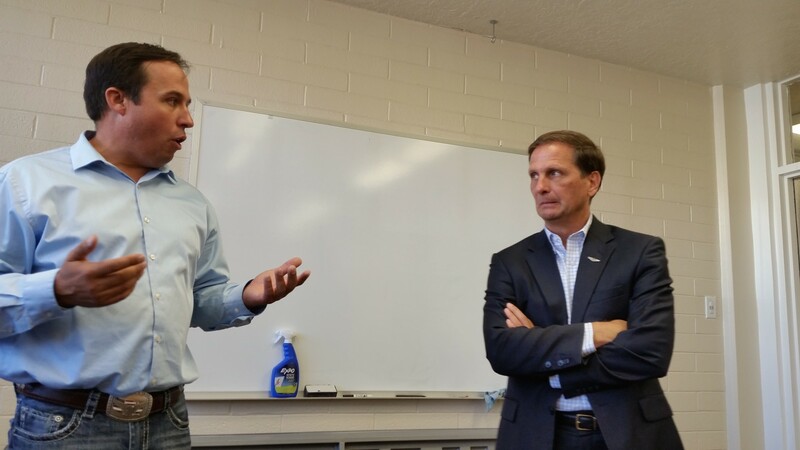 L-R: Washington County Commissioner Victor Iverson and U.S. Rep. Chris Stewart speaking to a group of off-road recreation advocates, Washington County Administration Building, St. George, Utah, Oct. 28, 2014 | Photo by Julie Applegate, St. George News. Washington County Commissioner Victor Iverson invited Utah Public Lands Alliance members and others in the off-road recreation community to a meeting at the county building with Rep. Chris Stewart and learn how Stewart can help. However, Stewart was late to the meeting due to other commitments, and only able to stay a few minutes. Meeting attendees took the opportunity to express their anger and frustration about the proposed land swap, continued loss of access to public lands and broken promises from local and federal officials. “Thirty years ago we were guaranteed and promised an open OHV area, and we’re still fighting for it,” said Milt Thompson, owner of Dixie Four Wheel Drive, a St. George business. Iverson stated again and again that the county has a legal responsibility to facilitate the land trade. “We’re trying to get through the renewal process without a major rewrite of the HCP (Habitat Conservation Plan),” Iverson said. He also said that if the proposed Sand Mountain exchange does happen, it will be the last one in that area. The county’s HCP was established in 1996 to deal with the threat of county-wide problems due to the presence of the endangered Mohave desert tortoise. The agreement set aside habitat for the desert tortoise and other species, while freeing up the rest of the county for development. The agreement created what is now the Red Cliffs Desert Reserve. The HCP agreement will expire and face renewal in 2016, and the county is under pressure to make progress towards completing any lingering land trades before the deadline. Since 2010, after a bankruptcy settlement, Bob Brennan has owned approximately 800 acres near the Green Springs area of Washington City, which is slated to be part of an exchange for the 1,200 acres on Sand Mountain. Off-road representatives repeatedly asked why another piece of property couldn’t be offered to Brennan, and later questioned why no other alternatives are being considered. Jeff Bieber is president of the nonprofit Desert RATS. “We’re not looking for a lose-lose situation, we’re looking for a win-win,” he said. There were originally seven entrances to the OHV trail systems on Sand Mountain, said Gil Meacham, president of UPLA, but construction of the new Southern Parkway cut off two of the seven entrances. Those two trail closures are causing problems for business owner Laurie Clay, of ATV and Jeep Adventure Tours. People don’t realize this is one of two places that has dirt, desert, sand dunes and swimmable water, Clay said, adding that she is “150 percent opposed” to the land swap. 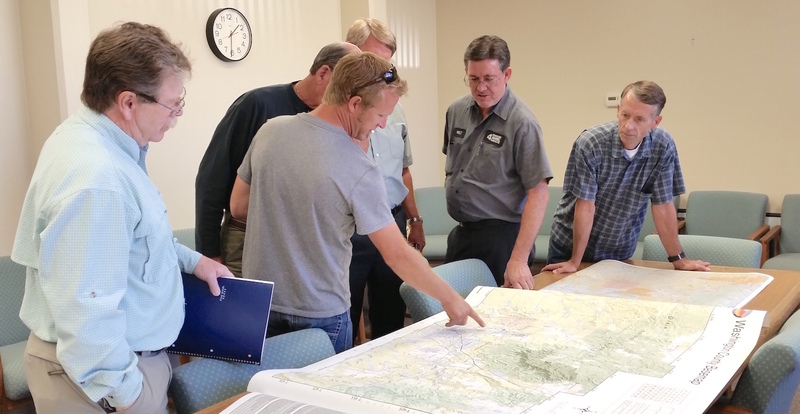 From left, UPLA President Gil Meacham, UPLA board member Eric Beard and other members of the off-road community discuss land use in Washington County. Washington County Administration Building, St. George, Utah, Oct. 28, 2014 | Photo by Julie Applegate, St. George News. Landowner and off-road enthusiast Stacey Eaton expressed frustration over the county’s refusal to consider options other than the 1,200 acres in the Sand Mountain off-highway vehicle area. While Brennan deserves to be compensated, Eaton doesn’t understand why Brennan is being offered his first choice of land for exchange. Eaton owned land in the preserve, and went through the HCP land exchange process himself starting in 2002. He owned 100 acres with surface and mining rights in Babylon Valley, located between Leeds and Toquerville. Eaton said he provided a list of 10 properties he was willing to trade for, but was turned down on every one. Eaton suggests taking Brennan’s land out of the HCP, and letting Brennan do with it what he wishes. The HCP boundaries have been changed a number of times, and this option was brought up when Eaton’s negotiations came to an impasse, he said. The HCP agreement is set to expire in February 2016. Management of the reserve will continue as it normally has since its inception if it is renewed; otherwise, the stability the HCP has provided could devolve into chaos. Even if complications delay approval beyond February 2016, the permit is still eligible for renewal as long as negotiations continue in good faith between the county and the U.S. Fish and Wildlife Service. As the debate continued, Iverson said he would meet with Eaton. Present at the meeting were several members of the United Public Lands Association; the Desert Roads and Trails Society, known as the Desert RATS; business owners already impacted by the Southern Parkway, and others. 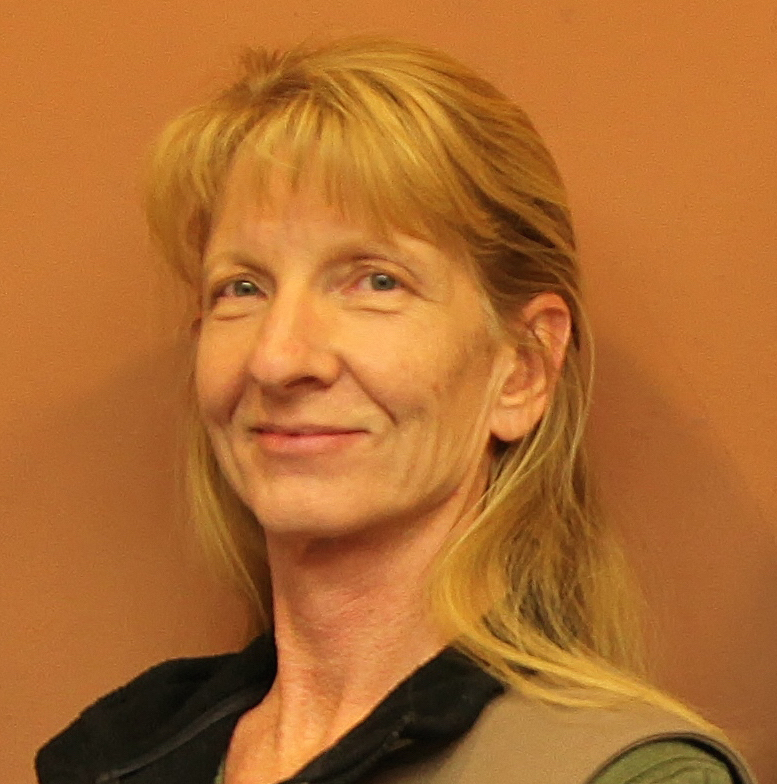 Iverson holds Washington County Commission Seat B by appointment of the commission in July when Denny Drake resigned. He is running for the seat against Democratic challenger Paul Van Dam in Tuesday’s midterm election. “He’s in a tough position,” Stewart said of Iverson. “He’s come in new, to a 20-year situation. The good news is that the federal government is not making this decision. We have someone local,” he said with his hand on Iverson’s shoulder. We were allowed to express our opinions regarding what should have happened before. We would like to see the county look at other options because we can’t replace these trails if lose them, or lose the quality of the trails by building right next to them.We will continue to work with the county to find a satisfactory solution. We are 100 percent opposed to the land swap. Remember, you get what you voted for, and if you voted for the “Show me the money” Republicans, you know the developers, especially those with whom those elected officials have vested interest, will flash the money to those Republicans will side with the developers every time. How does siding with a bunch of gun toting 4-wheelin’ rednecks who destroy public lands put money in those Republicans’ pockets? Don’t you know this by now with your previous Republican officials? The land belongs to the people not a government body, liberal fool. It has been your city and county Republicans who’ve made the deals to sell off those lands to the highest bidding developer. I person that files bankruptcy has all ready proven to be a thief. Therefor to make it Easy. Ensure the land swap is made with a contract attached that gives all OHV access to the use of this, land how ever they see fit, for the purpose of riding OHV. This could be set up in terms free of charge to public and time period of 200 years. By then all will be dead the land well used with no regrets.The thief that filed bankrupcy will have paid back society for being a miss managing, mid leading, dead beat. Once we have this one settled can we please figure away to get all the other losers to pay back the public, ya that includes you deadbeats that have or will short sale your homes. Yes your thieves also.once this is accomplished we can then all be forgiven. The screwed and the screwer. The county may have an obligation to making a land swap happen, but this is not the only area they could use. Brennan wants it because of its potential to make him money. The land owners in the Reserve have been wrangling for years to get as much as they can for their parcels. Some have rejected millions that have been offered to them because they want more. It’s all about greed. The off road people should not have to suffer because of this problem. Iverson is just doing what you straight ballot Republican voters will elect him to do (today) — represent the interests of the wealthy and powerful. A leopard can’t change his spots, why are you expecting Iverson to suddenly be interested not doing what he has already promised — turn the public lands over to the rich. Imagine how this would play out if the state controlled these public lands. The lands would be transferred to wealthy developers in the blink of an eye, and public access would disappear altogether. This is a classic example of local control gone wrong. This is what has happened for generations in eastern states where there are no federal lands. Local land managers listen patiently to complaints by the locals and then go ahead and give (er, sell) the land to developers who lock it up. Why are these people surprised? Maybe people will start to realize that the Utah Legislature is all about local (ie, business) control of public lands but I doubt it. If developers could, they would develop every state and federal park. I’m surprised there hasn’t been a petition to give it to Bundy. After all, wasn’t his family on these lands thousands or millions of years ago, before the dinosaurs? Maybe they even created those lands being that some people seem to worship them like some gods. Surely that makes them entitled to it. Actually the Bundy family did dinosaur ranching before they got into cattle ranching. They were the first people in the Southwest to introduce the full-auto spear with a flint hollow point. The Bundy family was almost wiped out in 3,264 BC during a massive stampede of Wooley Mamouths. But alas the family survived until today becoming one of the greatest BLM grazing fee cheats in the west. And Orin hatch drank some of the water from bundys ranch, so he should get some of the land also. Is this a dance free zone.? Yes mr Aids the buddies have been here for every, some of the first here, some of the toughest that could stay here and make cities for the next generations of lazy people to move here. This is where your family comes in, you being raised in attire world country that still trades their children off for a small piece of candy, where the women are so miss treated their privets parts are disfigured, the old and the poorest of poor eat what’s left over from the magit infested carcass. Where the sit with no a/c, no food in the cupboards, no running water, no beds, shakes. With leaking roofs. And no one in you ancestry has the ability or the knowledge or power to do anything about it. When you say your prayers tonight, be thankful for these folks that have to drive, the ambition, the knowledge and the love int their heart to travel and build all he amenities of life to better you heritages lives. Become humble now and change your ways or continue in this life as your family that’s came before you has. It’s a sad sad way to live. Koolaid could you please pass the decease in your own country only please. I said please. Hey imposter, your post suggests you may have been practicing inbreeding for several generations and still sucking off that government teat like your forebearers, because they and you felt entitled to it. The worst part of your inbreeding practice is that following generations are more stupid and lazy and acting more entitled to government handouts than your previous generation. You stole somebodies tag…nothing you say holds any water. That is a defamation. Maybe you should come up with something original. GO FALCONS! Yes, that’s right. Some poser imposter is using my name. It’s easy to see the difference. One thing we have to remember in this matter, it is the federal government that originally condemned private land by forcing the county to create a desert preserve on private lands. That created this issue. We feel the feds did not have the right to condemn the land, but we also feel the landowner does not have the right to take any land he chooses. Certainly, not in an open ohv designated area. He should have been limit his choice to land that would not have such far-reaching impacts. After careful examination of the chronology related to Mr Brennan’s eventual claim of the land parcel within the Desert Reserve, that was created for the Mojave Desert tortoise, it appears obvious that he was devious, calculated, and pre-meditated in his acquisition. Mr. Brennan was fully aware that the land could never be developed. Yet he loaned over $12 million dollars at 30% interest, (!!! ), on an amended Deed of Trust, so that when the bankruptcy was executed, he took ownership of the land. Now he expects to receive a 1,200 acre prime parcel of land within Sand Mountain SRMA, in partial exchange for his land. This is illegal with out an amendment to the RMP. This specific 1,200 acres contain a major, NO FEE, access for OHV to Sand Mountain, and two of the most popular trail rides are affected by this proposed land exchange. There are other public lands that can be exchanged with Mr. Brennan. Why is he receiving preferential treatment? Why are County Commissioners and other officials willing to give Mr. Brennan his 1st choice? Other public land owners voice that they never received even their 10th choice for exchange!